Maya Kitajima is a thirteen year old girl being raised by her impoverished widowed mother in Yokohama, and although she works part time in a Chinese restaurant to help her make ends meet, her passion lies with the theater. 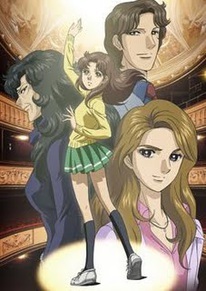 A random twist of fate bring her to the attention of both Chigusa Tsukikage, aging former actress and sole executor of the rights to the coveted “Scarlet Angel” play, and Masumi Hayami, the young president of the Daito Corporation. Both are fascinated by the girl, and Tsukikage sees tremendous acting potential in her. Over the objections of her mother, she ends up moving to Tokyo and joining the latter's acting troupe in the hopes of training to become a great stage actress. Little does she suspect the hardships she will face…or the rivalry with acting prodigy Ayumi Himekawa that will dog her career. It's hard to know which number will be greater: The number “glass masks” Maya Kitajima will don in the course of her rise to acting stardom or the number of volumes it will take mangaka Suzue Miuchi to complete her epic, three decades-old shoujo manga series, Glass no Kamen , i.e. “ Glass Mask .” Given these numbers—not to mention the story's popularity with generations of shoujo manga readers—it comes as no surprise that Glass Mask has been adapted onscreen on numerous occasions. The most recent came in 2005 with the 51 episode televised anime series from TMS Entertainment —and I am happy to report that it is an adaptation that does the vigor of Miuchi's original story, if not sadly, its visual beauty, justice. The plot through episode 26 can be divided into roughly three phases. The first is Maya's tenure with the well-financed Tsukikage troupe and the early phase of her training. It ends when dishonorable behind the scenes machinations lead to the troupe's disqualification in a national competition, which causes the troupe's funding to get pulled. The second plot arc involves Maya, now seeking acting opportunities under much reduced circumstances, basically becomes a freelancer. It is a decidedly slack period in her career, but it culminates into an offer she cannot refuse from the Daito Group. This leads to the beginning of the third arc, where Maya is now a proprietary Daito actress, headlining merchandising campaigns and television dramas. Interestingly, no one episodes is especially standout, either from a positive or negative standpoint. They are all good, and if you happen to like the theater, its exhaustive treatment of one classic play after another will be even better. The anime, unlike the manga, which began serialization in the mid-1970s, is supposed to take place in the present day. Nevertheless, there is something oddly out of temporal joint about it; many of the settings, particularly those involving Maya's hometown of Yokohama, look like they belong in another age. Either that, or they are timeless—and there is certainly an argument to be made about the persistence of rickety, One Room studio apartments and greasy spoon sorts of ramen joints. Yet in other respects, Glass Mask is a bit like trying to ram a square peg into the round hole of the 21st century modern world. Otherwise, how to explain the importance of stage theater, or the dearth of mobile technology (save for one cell phone in a conveniently placed area of no reception—do those even exist in the greater Tokyo metropolitan area these days)? And there are no computers at all. The most troubling aspect of the anime, however, is its, well, lack of animated detail. True, the Japanese have transformed limited animation into an art form, but Glass Mask does not in any way break new technical ground. Indeed, the animation quality feels rather substandard even when compared to television series of similar profile. For a classic storyline this would not normally be a problem, but the particular subject matter—stage acting—it becomes a huge liability. Many of the episodes are structured as a back to back comparison of Maya's acting versus Ayumi's; usually they are performing the same play. It's hard to sink into the magic of their supposedly genius interpretations because limited animation , alas, means limited expression. Even the artwork, design, and color palette choices feel mediocre. If seeing is believing, do not expect to believe. Don't expect a great soundtrack either. The less said about the insipid soft rock opening and ending themes, the better, and the voice actors, despite being cast in an anime about acting, deliver performances of workman like quality. Even Sanae Kobayashi , in heroine's challenging role, rises to the occasion but does not soar. Still, even if the cartoon medium is not the best way in which to convey nuanced theatrical expression, Glass Mask 's narrative structure and character development are more than enough to keep viewers coming compulsively back for more. The first couple of episodes in particular play aggressively to the emotions—watching Maya dive into ice-cold water just to retrieve a theater ticket after spending the entirety of New Year's Eve slaving away for it, or listening to her mother declare that she has no talent at all—it's over the top, no question, but you will surely cringe with sympathy anyway. Later episodes adopt what has subsequently become known as the “tournament” genre, and like the many famous properties that utilize this format, it is utterly addictive. Arguably the most interesting, not to mention potentially creepy, relationship in the series is that between Maya and Hayami. Of course, it comes as no major spoiler that Hayami is actually her mysterious Purple Rose Person, and Maya's failure to realize this strains believability, but their interactions are always intriguing. Furthermore, he is not just in it as an affectionate father figure to Maya, as it appears in the beginning, he is, we learn about midway through the show's run, that he is actually in love with her. This, in spite of being eleven years her senior. Needless to say, some of the characters have rather uncharitable remarks to direct his way when the find out about his feelings. Yet prurient interest alone might be enough to bring you back week after week: Is she really gonna end up with the guy in the end? Do they dare? + A classic shoujo epic that delivers unforgettable, gripping melodrama episode after episode. − Poor animation, soundtrack, and workman like voice-acting do not do justice to the subject.